For the past week, Castlederg has been near the top of the news agenda. 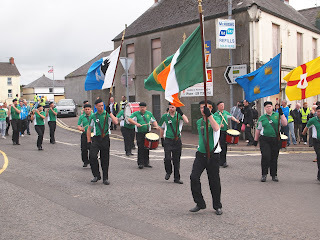 The small frontier town sits on the most westerly fringe of the United Kingdom, cheek-by-jowl with Donegal’s Finn Valley in the north-west of Ireland. 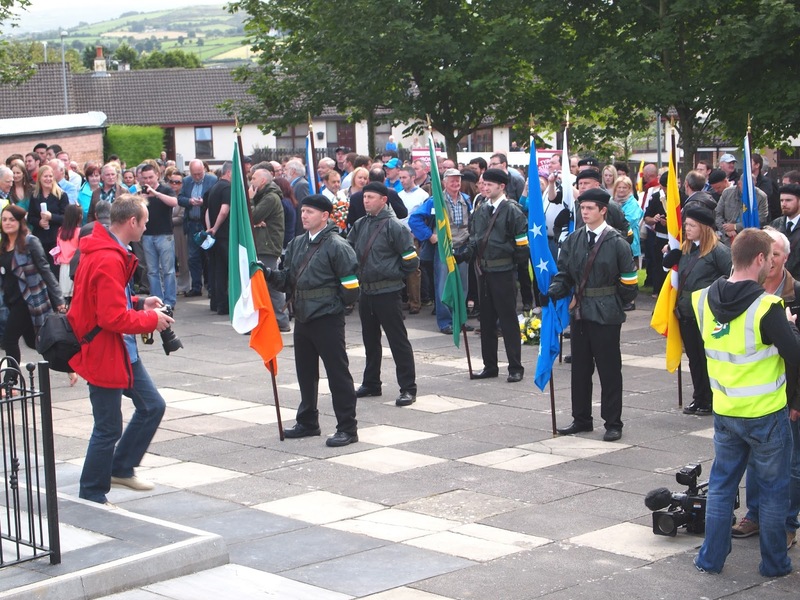 This was the chosen venue for the Tyrone commemoration of its ‘Republican dead’ from the recent conflict – including 53 IRA activists. 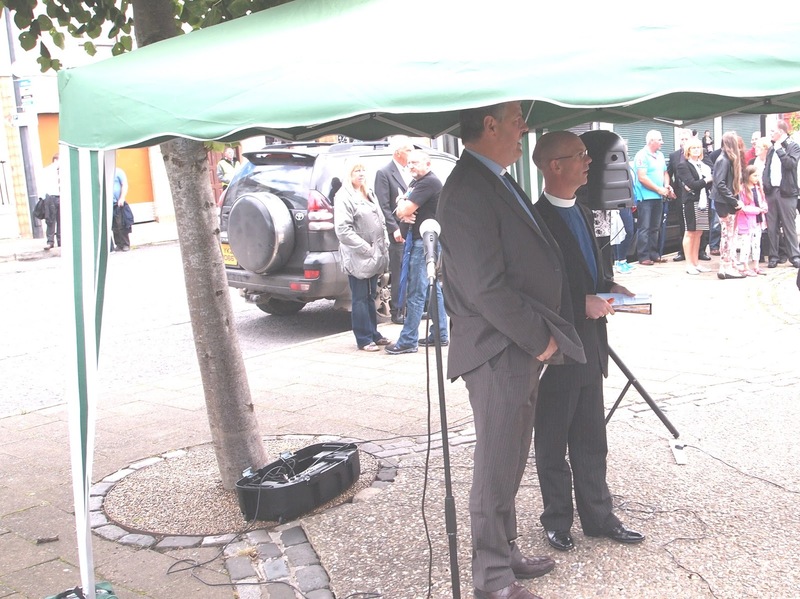 The event was timed to coincide with the anniversary of the death of two IRA men from the Castlederg area who were killed when the bomb they were transporting into the town exploded prematurely. 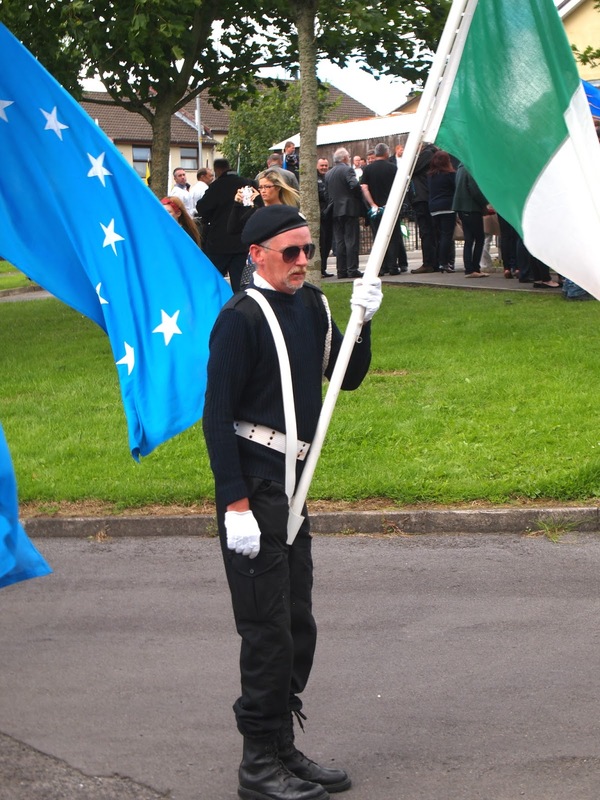 The Republican event caused outrage among members of the Protestant Unionist Loyalist (PUL) communities as a desecration of the memory of 31 of their family, friends and neighbours killed by the IRA in the locality. They organised a protest rally to coincide with the Republican parade. 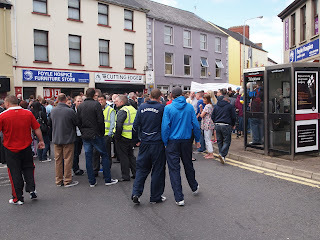 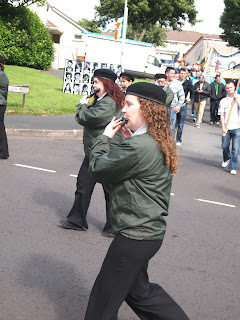 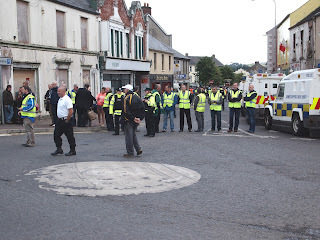 So on the afternoon of Sunday, 11 August 2013, Castlederg braced for confrontation at the Ferguson Crescent interface. This is where the town's two virtually segregated parts meet. 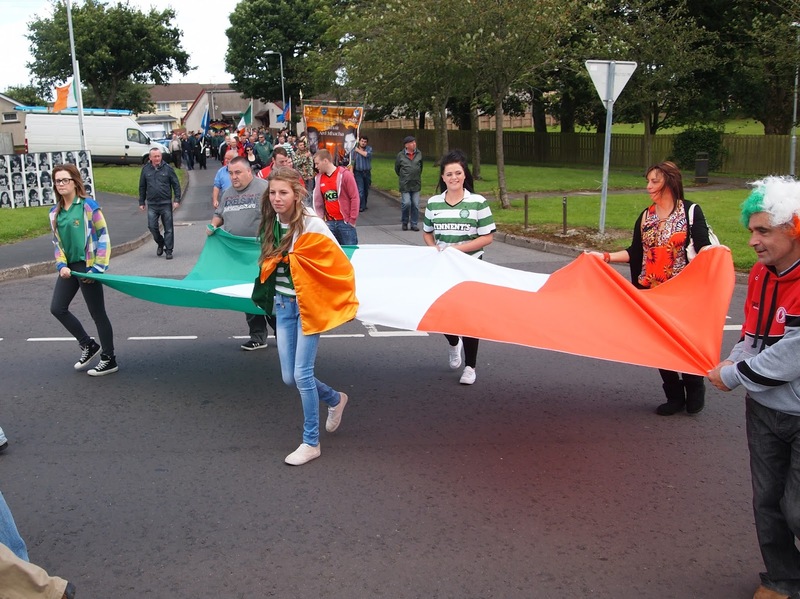 They are even designated by distinct names – Bridgetown, bedecked in union flags and loyalist bunting; and Churchtown, where the Republican parade would take place along Castlefinn Road and through the Catholic nationalist estates. Local Protestant clergymen prepare for the service on The Diamond that was the central feature of their protest. Republicans begin to assemble at the Priest's Lane car park. Gordon Speirs provides musical accompaniment for the protest prayer service. More Republicans gather at Priest's Lane. 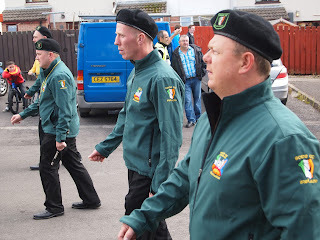 One of the Republican flute bands arrives. 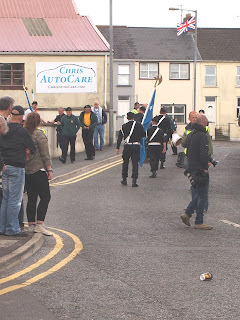 The Republican parade assembles in the shadow of the watchtower of the huge but now almost totally vacant Castlederg police fortress. Sinn Féin, including Pat Doherty MP on left, carry wreaths. 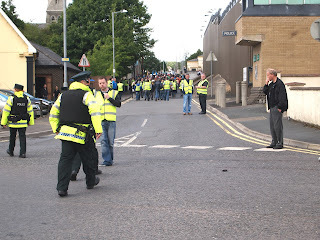 Republican stewards form a line across the Ferguson Crescent interface, with Loyalist stewards about 50 metres beyond them at The Diamond, with police in between. 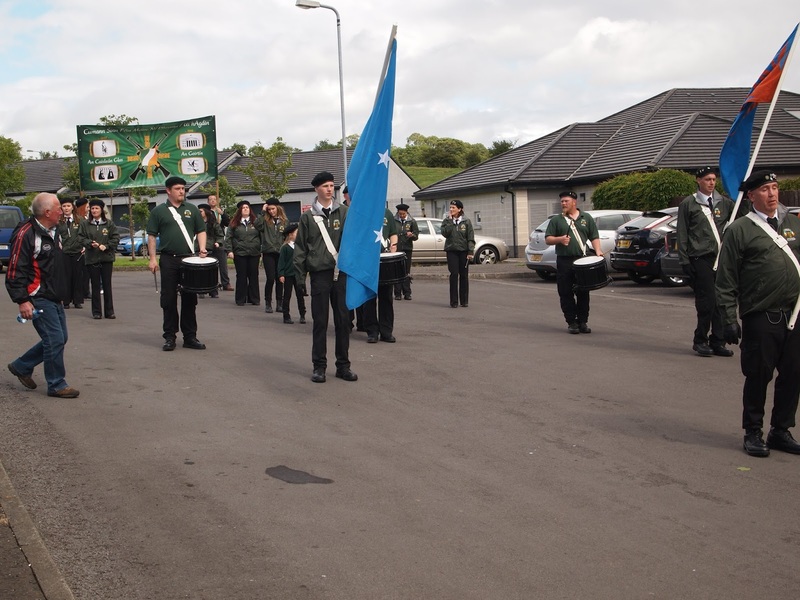 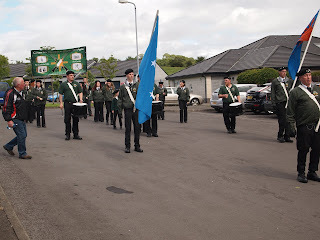 The provincial flags of Ireland are carried in the vanguard by the parade colour party. 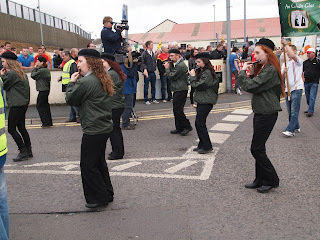 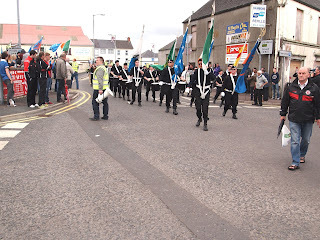 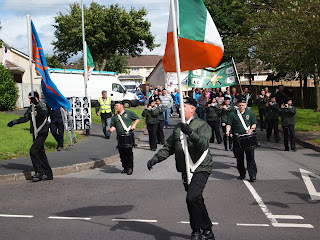 One of the Republican flute bands wheels around into Castlefinn Road. The Ulster flag with its provincial counterparts. 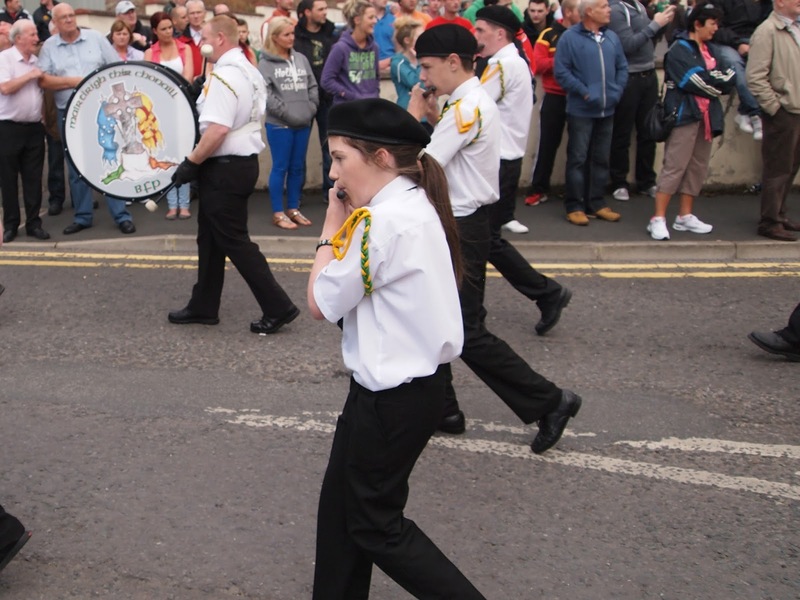 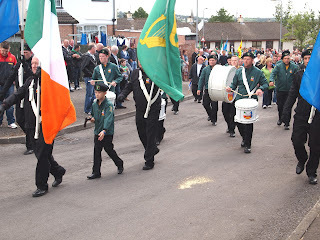 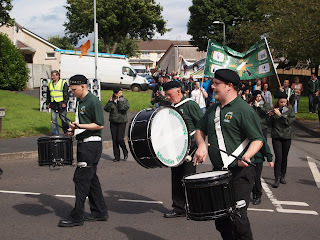 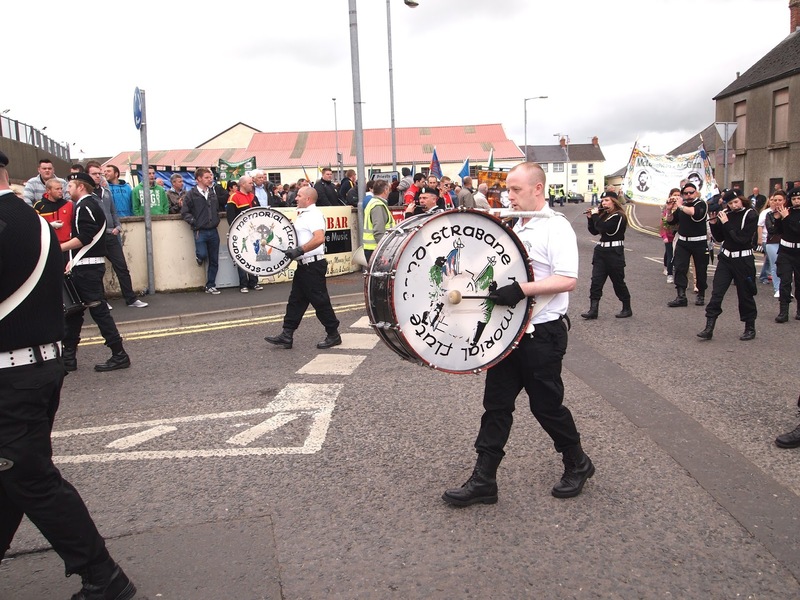 Strabane's Republican Flute Band features two bass drummers. 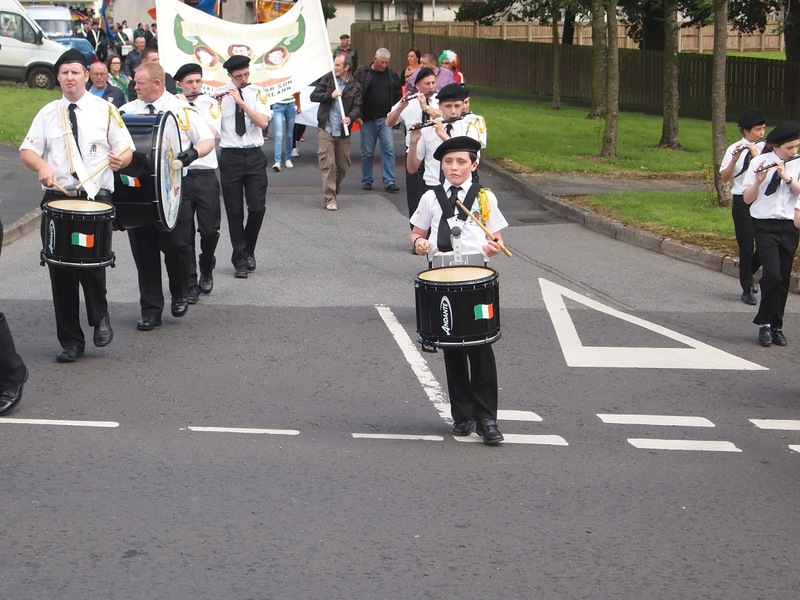 Strabane fluters set off on the parade route. 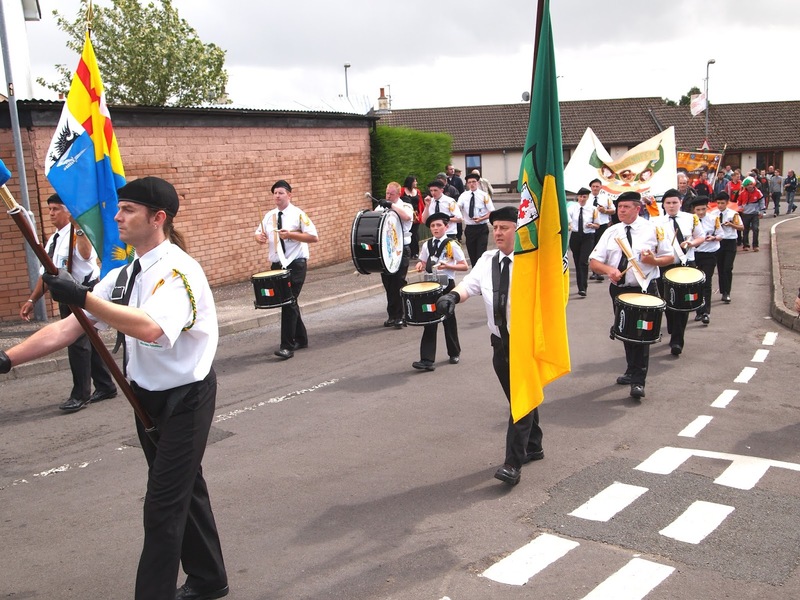 The colour party of Tyrone's Martin Hurson Memorial Flute Band. 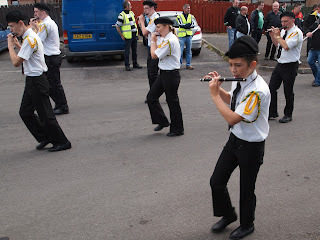 The Martin Hurson Memorial Band's flute corps. Fluters mark time as the parade stalls momentarily. 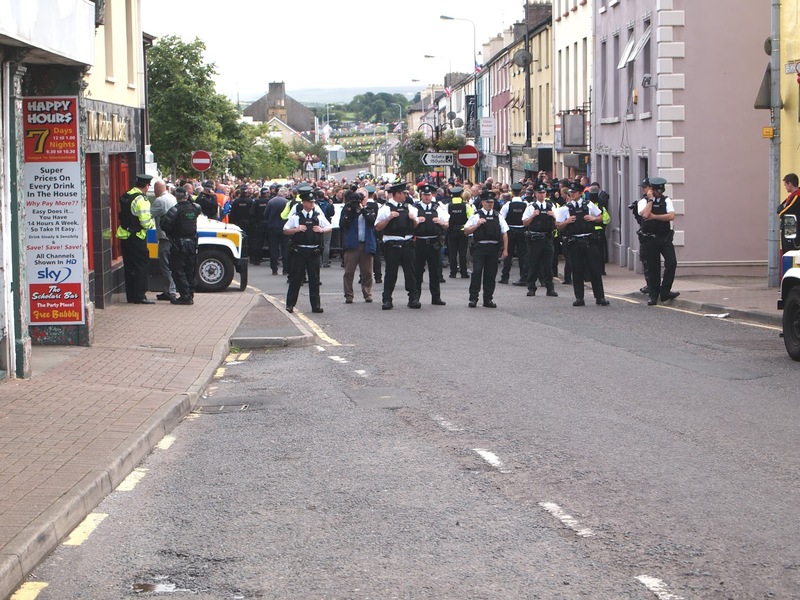 A commotion in the background, where one Loyalist protester made an attempt to break through caused police to rush to the far line of the interface. 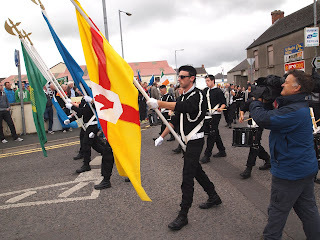 A Republican band from Donegal. 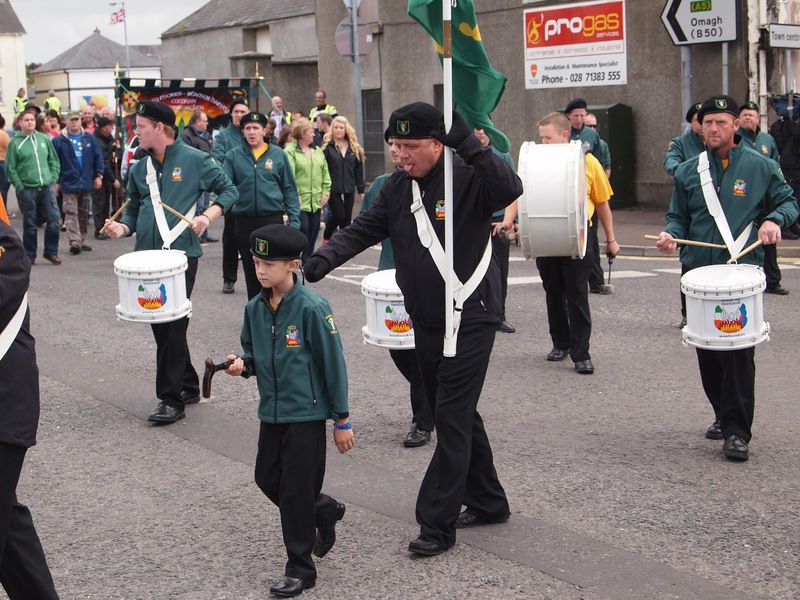 Tír Chonaill fluters follow their bass drum. A Sinn Féin group from Armagh city at the Tyrone commemoration. 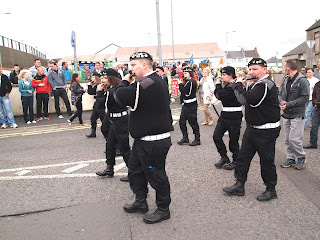 Another Republican band, from north Antrim, this time steps it out. 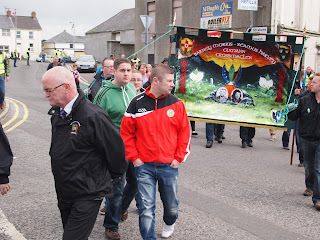 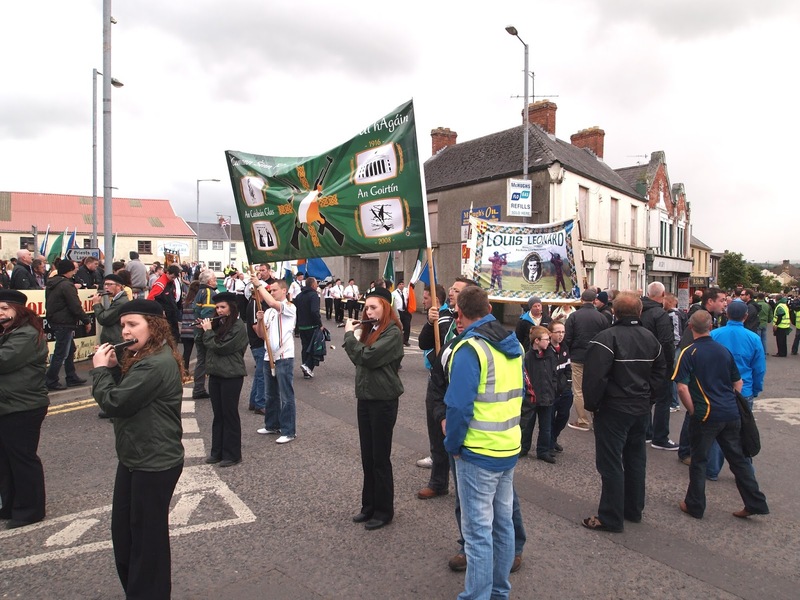 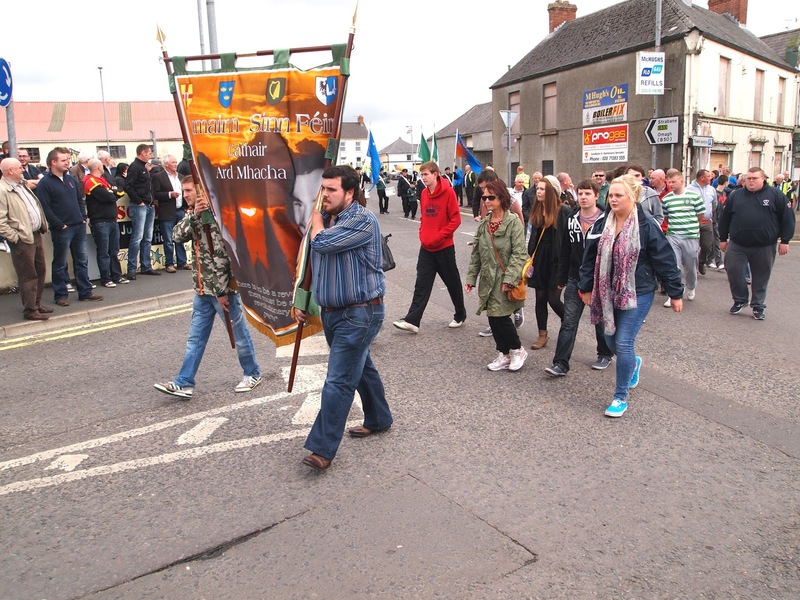 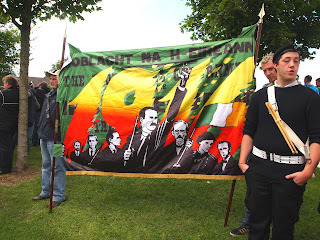 Crossmaglen Sinn Féin banner carried in the Castlederg parade. The final Republican band, from south Derry, steps it out. 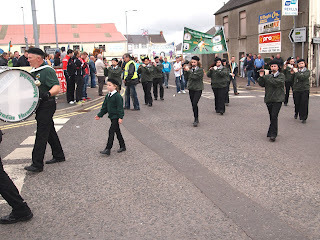 … as the Republican parade marches off up Castlefinn Road. 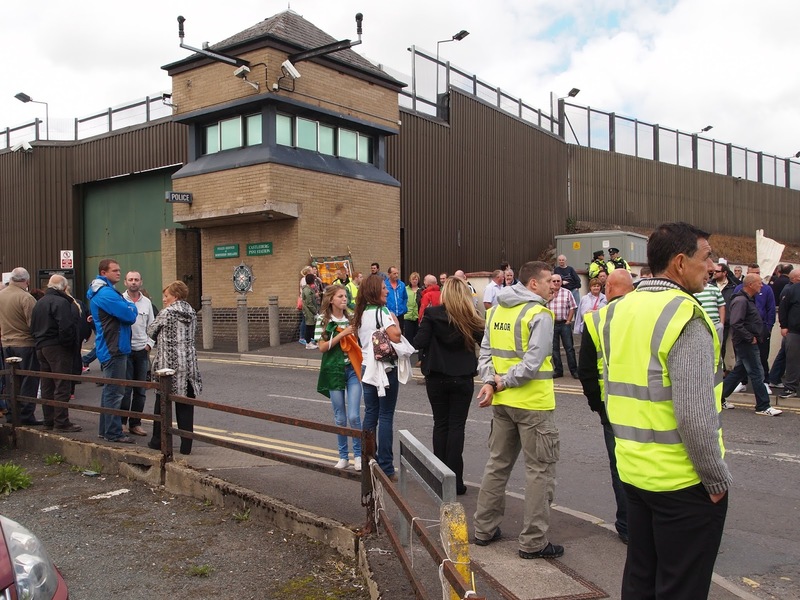 Back at The Diamond, Loyalist protesters gather at the 'Cutting Edge' of the town's interface. 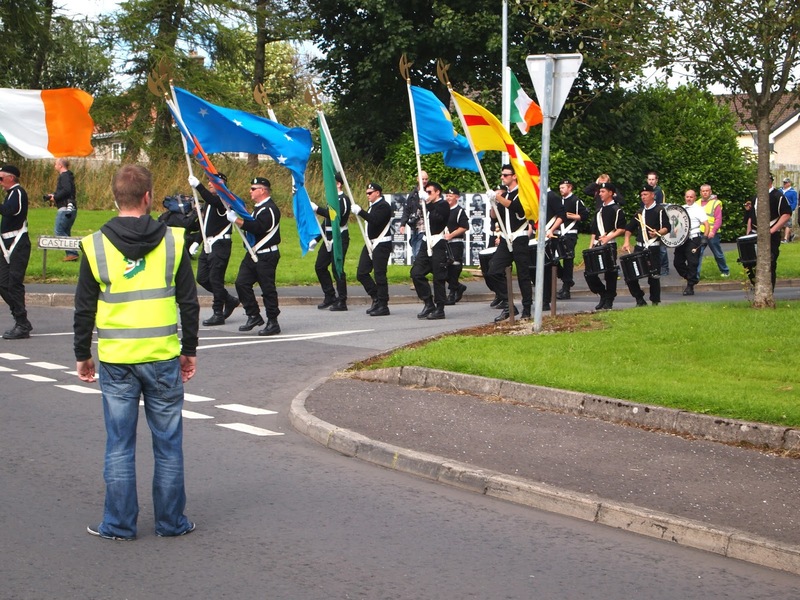 A parading band re-emerges onto Castlefinn Road from one of Castlederg's estates. 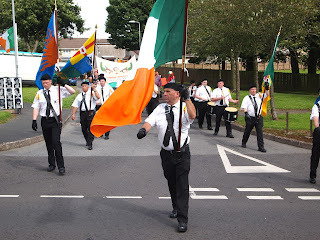 The colour party of the Martin Hurson Memorial Flute Band. Fluters in the Martin Hurson Memorial band. 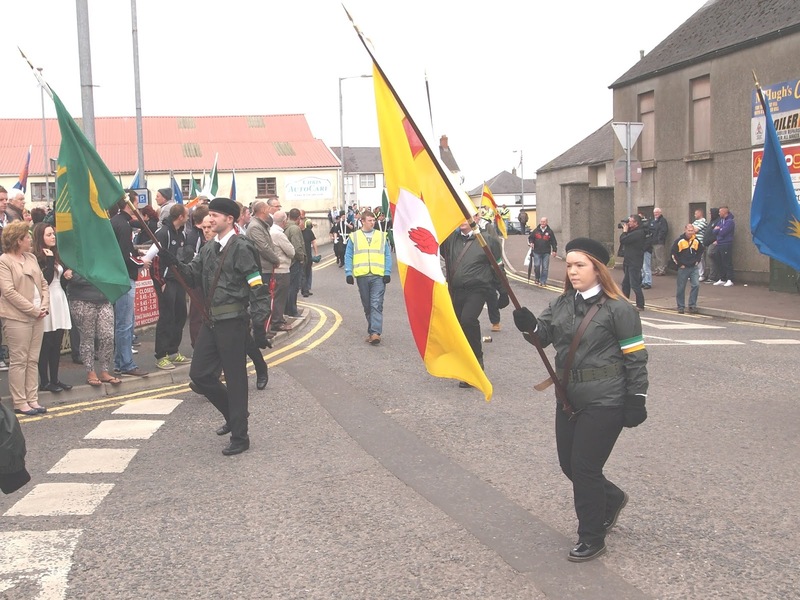 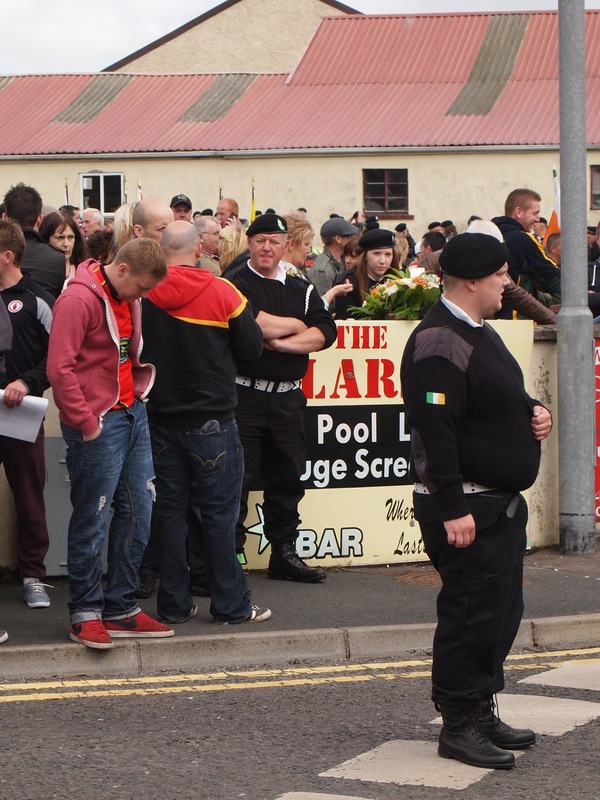 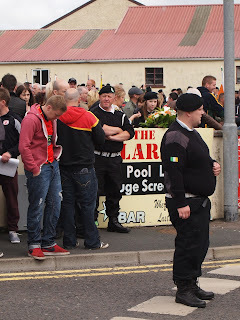 The Tír Chonaill colour party steps along. 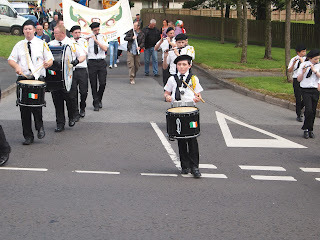 A young drummer flanked by his bandsmen. 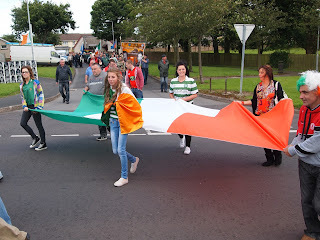 Bearing along the Irish tricolour. Flag-bearer at the end of the parade route. The Donegal band arrives at the Republican shine in Castlederg. 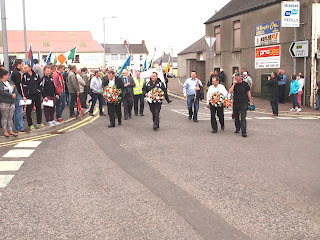 The Martin Hurson Memorial RFB prepares to fall out. 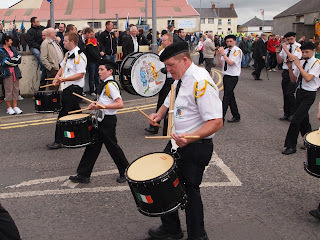 Marking time on the last tune. 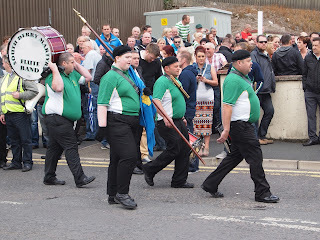 The Rasharkin Sons of Ireland band arrives. One of the banners carried on the parade features 1916 heroes. 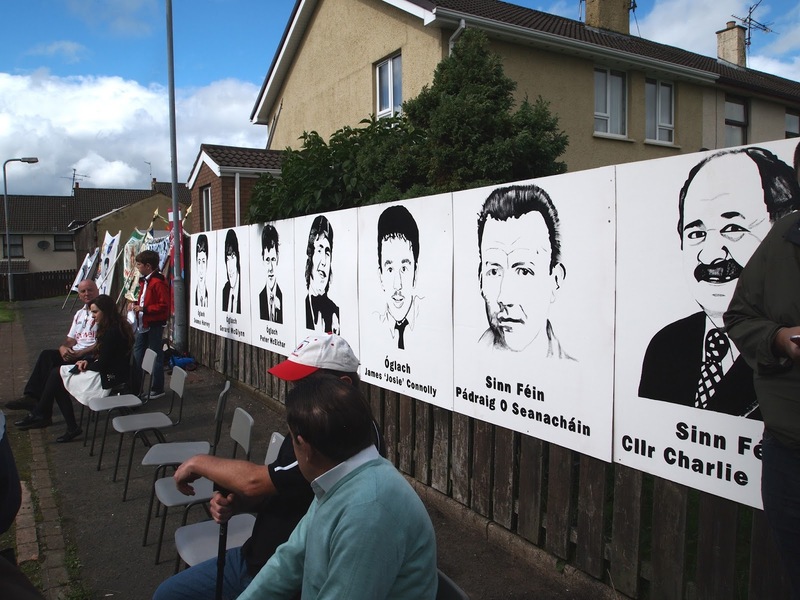 Images of local republican heroes on the wall above the shrine. 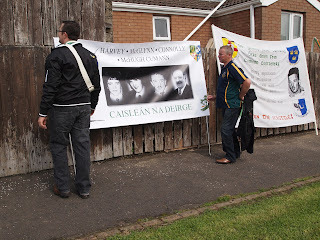 Castlederg republicans display their banners. 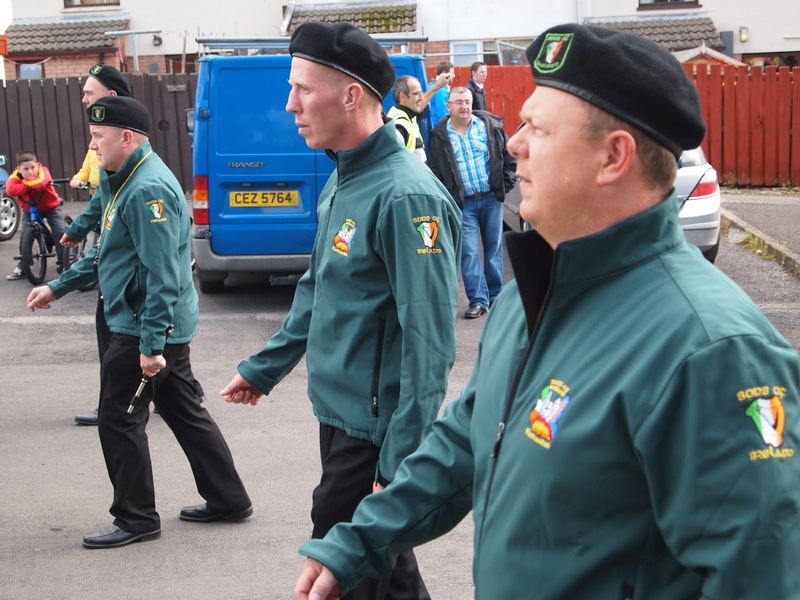 The colour party line up before the new Republican shrine. 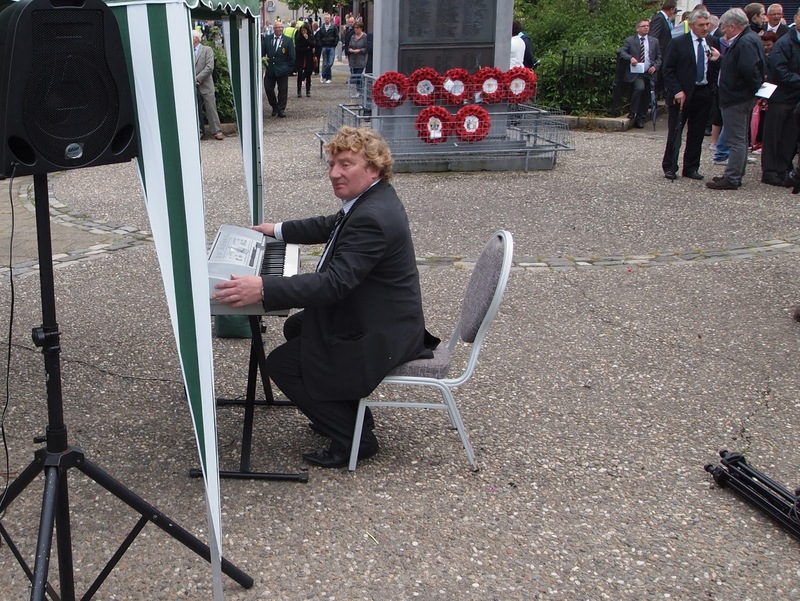 Didn't really get the point of this story? 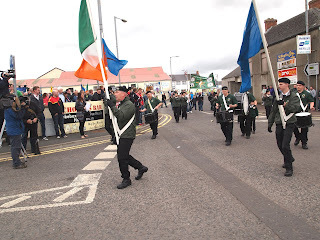 Was it to publish republicans marching?